LOCK NUT We offer a qualitative range of NUTS available in various technical specifications. These can be easily tailored according to the specifications provided by our clients. These are the most common form of NUTS, which are intended to be used on external or male screw threads such as a bolt, for the purpose of tightening two or more components. HEX NUT We offer a qualitative range of NUTS available in various technical specifications. These can be easily tailored according to the specifications provided by our clients. These are the most common form of NUTS, which are intended to be used on external or male screw threads such as a bolt, for the purpose of tightening two or more components. 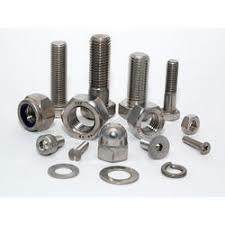 HIGH TENSILE NUTS We offer a qualitative range of NUTS available in various technical specifications. These can be easily tailored according to the specifications provided by our clients. These are the most common form of NUTS, which are intended to be used on external or male screw threads such as a bolt, for the purpose of tightening two or more components. Wing- Nut We offer a qualitative range of NUTS available in various technical specifications. These can be easily tailored according to the specifications provided by our clients. These are the most common form of NUTS, which are intended to be used on external or male screw threads such as a bolt, for the purpose of tightening two or more components. HIGH QUALITY NUTS We offer a qualitative range of NUTS available in various technical specifications. These can be easily tailored according to the specifications provided by our clients. These are the most common form of NUTS, which are intended to be used on external or male screw threads such as a bolt, for the purpose of tightening two or more components. DOMED NUT We offer a qualitative range of NUTS available in various technical specifications. These can be easily tailored according to the specifications provided by our clients. These are the most common form of NUTS, which are intended to be used on external or male screw threads such as a bolt, for the purpose of tightening two or more components. LIFTING EYE NUT Offered by us is a wide range of LIFTING EYE NUTS that are widely appreciated throughout the globe for the rugged construction and durable finish.These find usage in various industries like steel, cement & construction industry. Some of the specifications of LIFTING EYE NUTS are enriched with the mechanical properties of forged steel and can also be customized as per the needs of the clients based on the surface treatment. Teflon Stud , Bolt & Nut The Extensive range of Teflon Stud , Bolt & Nut offered by us is available in different sizes so that its fits various applications. They are widely appreciated for their durability , sturdy construction , features & application specific designs. Teflon / Xylan Coated Stud , Bolt & Nut We Offer Quality range of Teflon / Xylan coated Stud , Bolt & Nut in various specification mainly for Oil & Gas , Valves , Industries. We export this mainly to Middle east & domestic market. We offer in following Grades L7 , L7M , B7 , B7M , 7 , 7M , 2H , 2HM.